There are many computer graphics games projects in the opengl. We have discussed many of them like ludo, snake xenia, mancala etc. Here are we have a new game projects in computer graphics. You may remember the childhood video game where we play the game of tetris. 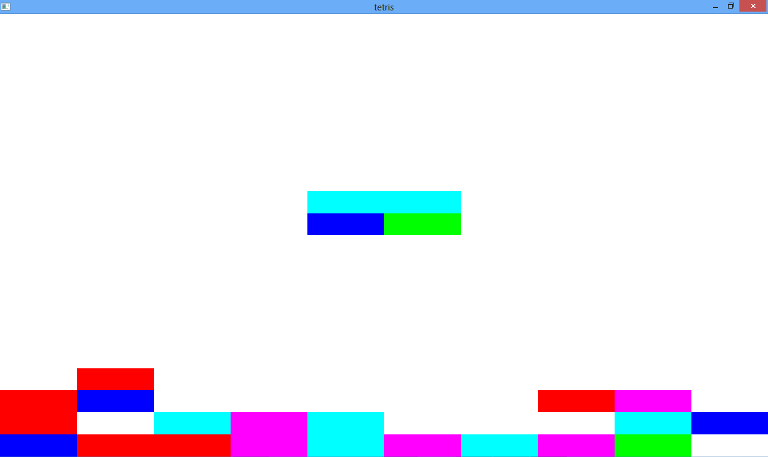 Here we are going ti implements the game of tetris in Opengl computer graphics. The project is some what complex but not long. It has fewer lines of code. Logic is to have the function that define a random change of blocks or the shapes when key is press . With key press the angles are changes and hence the shape of the blocks are determines in each key press. The change is also selective and act on chosen shapes, means a shape of of long line may have four block in horizontal and vertices and no other shapes. The color is also randomly selected while for shapes changes it remain same. The important feature that this project lac is the disappearance of blocks as the line get filled. While timers and scores can be added in future to this projects along with sounds in the Opengl computer graphics. I hope this computer graphics games projects would helped you in CG course or other ways. Download the source code Tetris game projects in Opengl computer graphics and comments for any query, problem, suggestion or alteration.